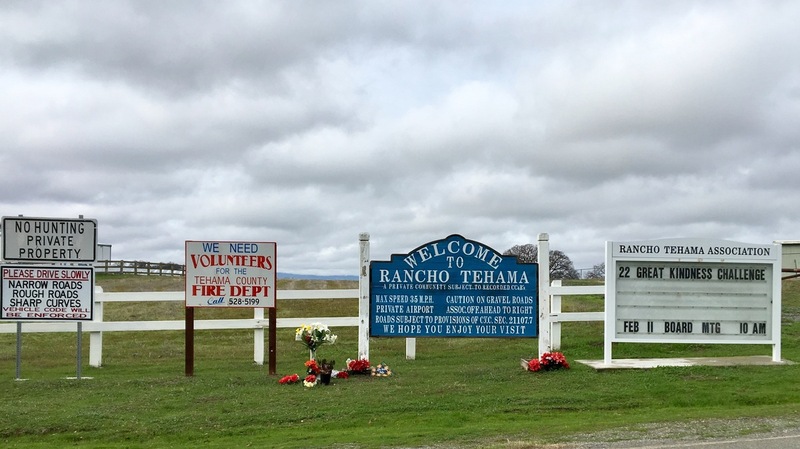 California Town Wrestles With Aftermath Of Shooting Rampage A visit to Rancho Tehama shows a small, rural community still struggling with the fallout from last fall's massacre in which a gunman killed five townspeople and wounded 12 others. On Nov. 14, 2017, a shooter killed five people and wounded several others in the rural Northern California town of Rancho Tehama. Parents and school officials are thankful, yet still deeply shaken; some of the wounded feel forgotten and misled; many residents feel the police dropped the ball and say officers should have kept a closer eye on a troubled man whose life was clearly spiraling out of control. The attack in Rancho Tehama, population just over 1,400, was among the more than 300 mass shootings in America last year in which four or more persons were wounded or killed. The bigger ones, including the deadliest mass shooting in modern U.S. history, received lots of coverage by us and other media during and after the attack. The smaller ones often received far less. We wanted to see how people in this small community were coping now that all that coverage has faded. A black and red RANCHO STRONG banner hangs across the entrance to the collection of L-shaped trailers that make up the small Rancho Tehama Elementary School. Inside, the walls of secretary Sarah Lobdell's office are adorned with colorful "thank you" cards and well-wishes from across the state and the nation. The cards are for her swift action last November. She's used to the echo of gunfire in this rural community. Target practice; hunters; the odd drunk shooting at the moon. But on Nov. 14 she knew this gunfire was different. "There was no question about it, it was too close to us and it was...," she pauses her voice cracking with emotion. "It was going to put everyone in a dangerous spot." Lobdell immediately called for every child and teacher to go inside, fast, and get into lock down mode they'd practiced. "There was absolutely no question, no hesitation and I do believe that that also helped," she says. Lobdell's fast action likely averted a massacre. The night of the shooting, Corning Union Elementary School District Superintendent Richard Fitzpatrick said those few seconds made all the the difference. He praised his staff. "The reason we have a situation where I have one student injured on campus and nothing worse happening on campus is because of the heroic actions of all members of my school staff," Fitzpatrick said. "Every. Single. One of them." Police believe the gunman, Kevin Neal, was likely targeting the neighbor's son, a kindergartner at the school — and anyone else who got in his way. Unknown then to the school, Neal already had shot and killed his wife and two of his neighbors before driving to the school that morning loaded with ammo and several semi-automatic weapons. Witnesses and surveillance video show he stalked the school's courtyard, seemingly furious he couldn't get inside. He fired repeatedly at the locked-down doors, windows and walls. 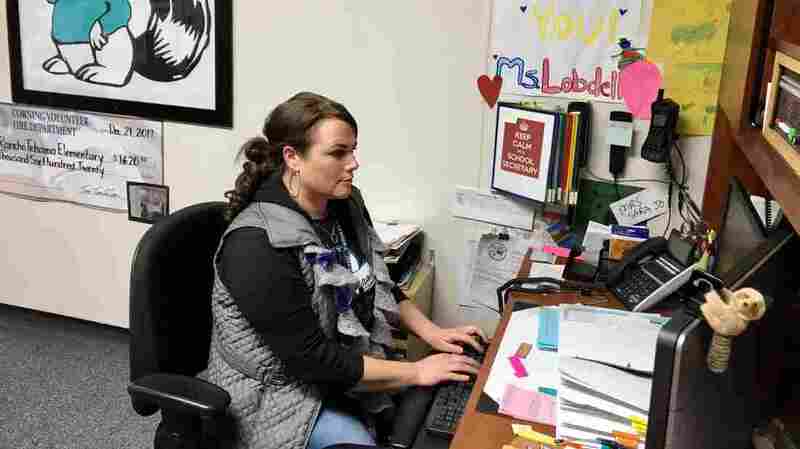 Sarah Lobdell is the secretary at Rancho Tehama Elementary School. When she heard the shots last November, she immediately called for every child and teacher to get inside and go into lock down mode. Lobdell shuns talk of her heroism that day in favor of words like "training" and "instinct." "One of the teachers quoted, 'the students are the heroes.' And we all strongly agree that..."
"It is very tough. There are terrific days and we're all so thankful," she says. "But it's real. And we still have that sense of 'we can't believe this really happened. Did this really in fact happen?' Yes it did. Yes it did." Since the rampage, an armed security officer is now posted at the school full time. "There's a small bundle of plastic flowers honoring the dead at the "Welcome to Rancho Tehama" sign when you enter the town. Nearby the community's lone eatery, a café and deli that was open during the shooting, looks like it's now out of business. Blinds are pulled, lights off, and the "open" flag is gone. Elsewhere the signs are less visible. They show up in people's psyches, or behind closed doors. Sandra Wells's 5-year-old daughter is happily back at school. But Wells says her kindergartner is not really the same since she had to run and crouch in fear as the crackle of gunfire echoed. Outside Rancho Tehama Elementary School after the shooting on Nov. 14, 2017. "She was not wetting the bed anymore, but since the shooting she started pottying the bed and stuff again," she explains. "And she has these night terrors, she wakes up yelling things. And she actually just the other day brought up the shootings again. It's hard for us to talk to her about it. But we try to, you know, communicate with her the best we can. We're not sure how." Neal was killed by a self-inflicted gun shot. He also had been shot by deputies just a hundred yards up the road from Mike K.'s house. The retired contractor didn't want his full name used. "I had a weapon in my hand. I was ready," he says of that fall day. Three months later, Mike says, people are still on edge. "Everyone's got their antennas up. I've got my antennas up all the time. It was a real big shock." Several of those wounded that day say they feel forgotten. Francisco Cardenas was driving to the post office a few minutes from his house that morning when he was caught between deputies in hot pursuit and the shooter. He was sprayed with glass, metal, and bullet fragments from both sides, he says, as he crouched in the front passenger side of his truck. "It hurt. It was so close I was almost like 'just get it over with, just hit me.'" His leg was badly shot up. He was bleeding out. And by the time police got to him, Cardenas says, he was pretty sure he wasn't going to make it. "I just told [police] to tell my wife and son I love them and I just faded away. I just went to a peaceful place and I just think 'I just died,'" he says. Cardenas was eventually airlifted to a hospital. The 35-year-old tree trimmer is now unemployed and, for now, unable to work because of his wounds. He moved out of town, several hours away and into his parent's house with his wife and son. Help from family and a few thousand dollars from his Go Fund Me page are all that have helped them get by. Bills and fear are piling up. Cardenas says pledges of help to cover some medical costs — transportation, medicine, mental health care — have yet to materialize from the sheriff's office and the California victim's compensation board. "[The board] promised lots and lots of good stuff, but it turns out they are not really covering all those things and no real help coming from them," he says. "I feel like they and the sheriff's office were setting me up for failure." Cardenas says he's exploring his legal options. Several others wounded told of similar frustrations and anger. They declined to speak on the record citing potential legal action. Chris Van Horne with CalVCB confirms the board, so far, has paid out only $100 in all for medical bills for the 12 wounded in Rancho Tehama. It's not clear why the wounded have received so little thus far. By law, Van Horne says, CalVCB cannot disclose any more information about specific victims or applicants. The board did pay out more than $14,000 in total to families of the dead to help pay for funeral expenses. There's also lingering frustration with the Tehama County Sheriff's office. There's a sense that deputies here failed to stop a man that appeared troubled and who was sporadically violent: he had attacked and stabbed his neighbor. He'd made threats. "I do believe the sheriff's department dropped the ball when they let this guy (gunman Kevin Neal) live out here with a lot of guns," says local realtor Vern Wilson, who has lived in Rancho Tehama for more than two decades. After getting out on bail for the stabbing, the gunman was slapped with a temporary restraining order or TRO. Neighbors also complained that he fired off weapons regularly — even though he wasn't supposed to have any firearms under the terms of the TRO. He turned in one registered handgun to a vendor. But Neal secretly kept several homemade, unregistered AR-15 semi-automatic weapons and handguns. 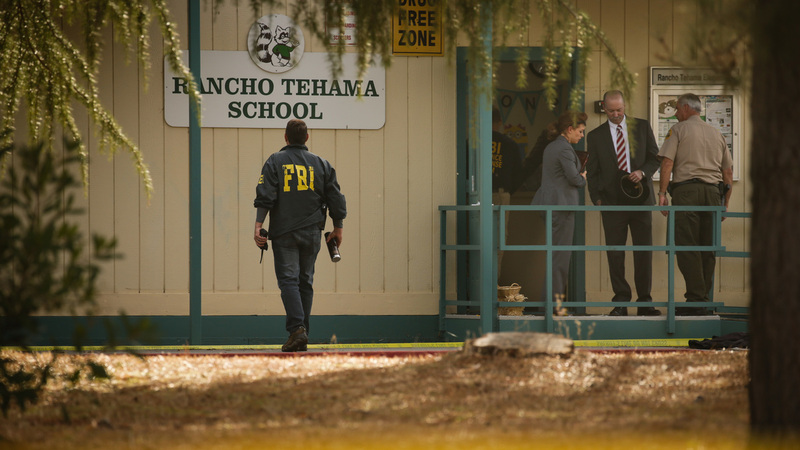 "They were kind of elementary," says Assistant Tehama County Sheriff Phil Johnston. "It was clear that he was experimenting with building guns at home outside the law." His neighbors complained regularly that Neal was firing off rounds day and night. The police confirm they got, on average, three complaint calls a month for nearly a year about Neal's behavior and gunfire. A bullet hole is seen in an exterior wall at the Rancho Tehama Elementary School on Nov. 15, 2017. Gunman Kevin Janson Neal is believed to have spent six minutes shooting into the school before driving off to continue his shooting spree. 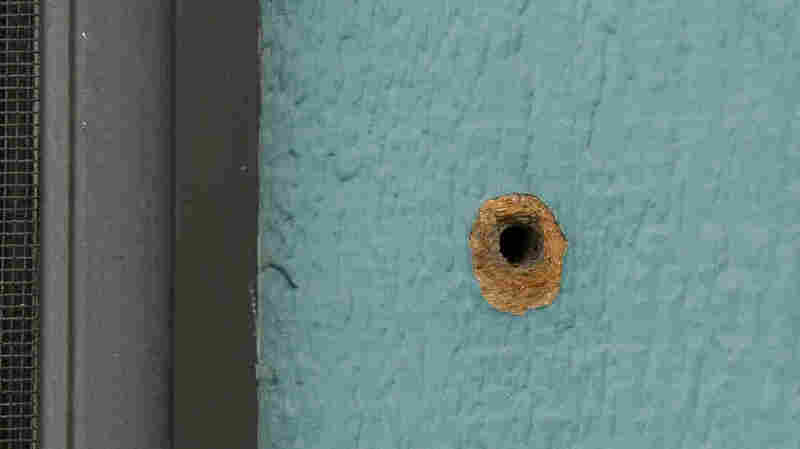 One student was wounded by gunfire and a second by flying glass. "With how violent he was and his record they should have came and made sure his guns were gone," parent Sandra Wells says, echoing criticism heard from many residents here. "They should have never allowed him to get bailed. And if they did he should have been supervised with an ankle [bracelet] or something! It's crazy." Realtor Wilson says police should have been more vigilant. "He had complaints against him and they never did anything about it except knock on his door," he says. "He didn't come to the door so they moved on. That was a big mistake." Like many here, Wilson fully understands that the department is tasked with covering an large, rural county with limited resources. "But this was pretty obvious," he continues. "Hopefully if they get anything else like this again they'll look at it a little closer," he says. It's a question many here ask: couldn't more have been done to stop this, to at least enforce the restraining order against the gunman? It's something Assistant Sheriff Johnston seems to struggle with. "Well there was no direct violation of the TRO that we could sink our teeth into for sure," he says. So they didn't have the evidence to search his home? "Absolutely not," Johnston says, adding, "There was no big red flag with this guy other than he was not law enforcement friendly. He was rude to our officers, but that's not a crime." The sheriff's office set up surveillance a few times. They struck out. No one, Johnston says, seemed to see Neal shooting a weapon. "On every occasion we responded, asking 'did you actually see him firing a gun?' 'No.' Here's the things we look for: shell casings on the ground, something fresh that we could use, evidence that we could use to write a search warrant. That just didn't happen for us in this case," he says. Johnston was one of the first on scene that day. He tended to a wounded family, called in medical care, set up a roadblock and helped orchestrate the police pursuit. It's clear Johnston, too, was altered that day. It's evident in a response that seems to linger somewhere between regret and resignation. "Changes the way that I think of law enforcement," he says. "I used to really believe that my job and being a law enforcement officer was to help protect people and I believe that I can't control that. That if some individual wants to storm some building, that I can't control that. You want to think that you have the ability to protect people from that and you don't have that ability.